IPL 9 2016 Edition will be kicking off shortly by next week. 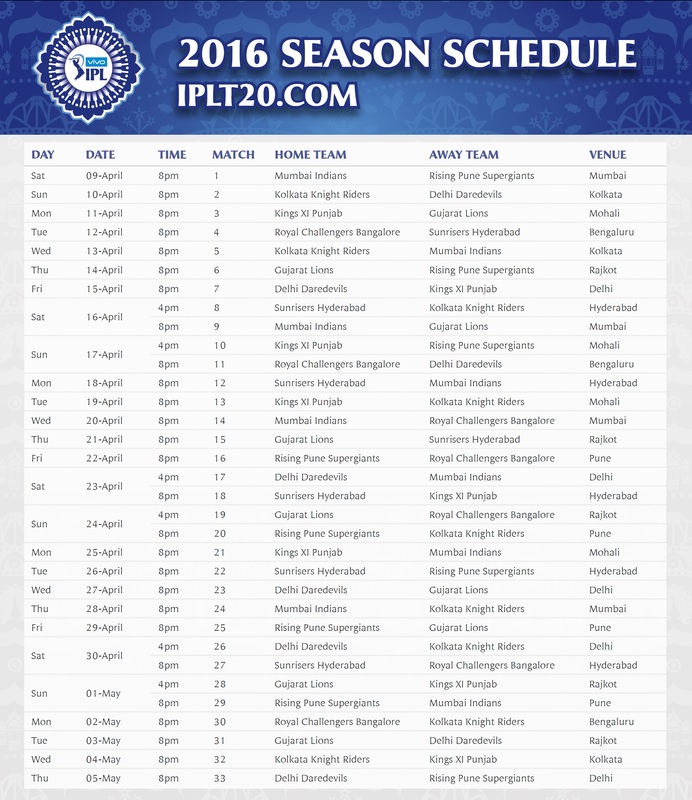 I have updated the latest schedule of IPL 2016 to this page and if any update will be reflected to this post. 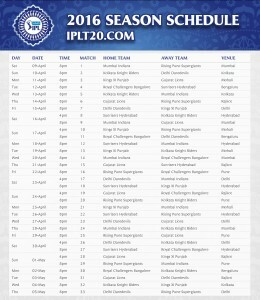 Download PDF version of IPL 2016 Schedule below. TO DOWNLOAD JPG VERSION CLICK ON IMAGE BELOW. Due to the ongoing Telangana agitation in Andhra Pradesh, Indian Premier League authorities had shifted all matches of Deccan Chargers from Hyderabad and Visakhapatnam to Navi Mumbai and Nagpur. But after several rounds of talks, IPL authorities have finally decided to schedule 2 matches of Deccan Chargers team to be played in Cuttack. 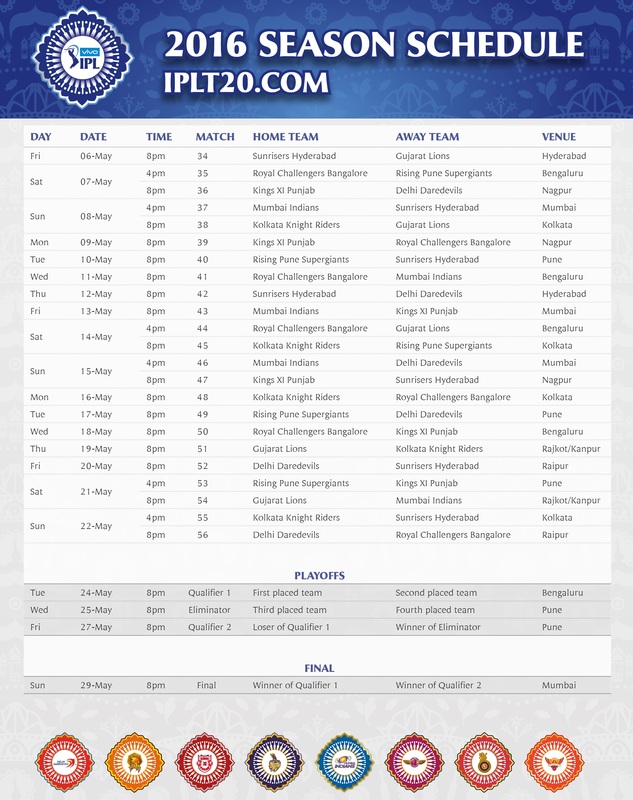 Checkout the complete revised schedule of the IPL 3 matches. The opening IPL 2010 match would be held in Navi Mumbai’s D Y Patil Stadium, while Cuttack would be witnessing Deccan Chargers vs Kings XI Punjab and Deccan Chargers vs Delhi Daredevils. You can also watch IPL 3 online on youtube. Mar 12: Deccan Chargers (DC) vs Kolkata Knight Riders (KKR), Navi Mumbai, 8 pm. Mar 13: Mumbai Indians (MI) vs Rajasthan Royals (RR), Mumbai, 3 pm; Kings XI Punjab (KXIP) vs Delhi Daredevils (DD), Mohali, 8 pm. Mar 14: KKR vs Royal Challengers Bangalore (RCB), Kolkata, 4 pm; Chennai Super Kings (CSK) vs DC, Chennai, 8 pm. Apr 3: CSK vs RR, Chennai, 4 pm; MI vs DC, Mumbai, 8 pm. Apr 25: Final, Navi Mumbai, 8 pm. 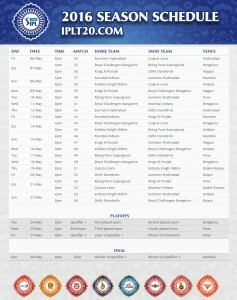 THANKS FOR IPL 2016 SCHEDULE..
pls post IPL 9 SCHEDULE 2016 in pdf version..